It’s a page turner – thank you! Wirksworth’s very own Book Festival scores success for a second year running. Having just successfully completed its second year, Wirksworth Festival’s sister event the Wirksworth Book Festival was a clear winner. Some 470 people attended the 15 events across the town and organisers Heather, Val, Carol, Naomi, Ken, Bill and Jenny would like to thank everyone in Wirksworth and beyond who supported the Wirksworth Book Festival. A huge thanks goes out to all the speakers, venues, volunteers and friends, and to the audiences! Wirksworth Book Festival is now looking for next year’s local writers and venues to form the core of what the event is about – free events, showcasing local writers. If you’ve any suggestions please do drop Val Stacey a line. 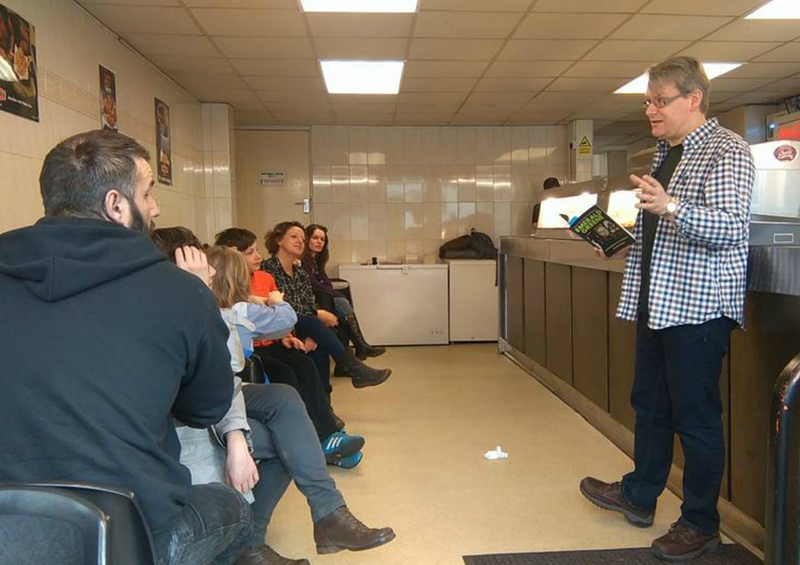 The above image shows Dr Who author Daniel Blythe giving a talk at Wirksworth Fish Bar – image credit Bill Bevan.